Weleda Pomegranate Regenerating Oil was $26 and it totally blew me away after the first use. It's amazing in every possible way. First of all, it absorbs instantly. You can slather it on after the shower and go run your errands the next minute. The skin feels very comfortable and soft after using it. The smell is nothing out of this world but still very lovely. Before I've discovered this body oil I've been using Burt's Bees Mama Bee oil and I was loving it. 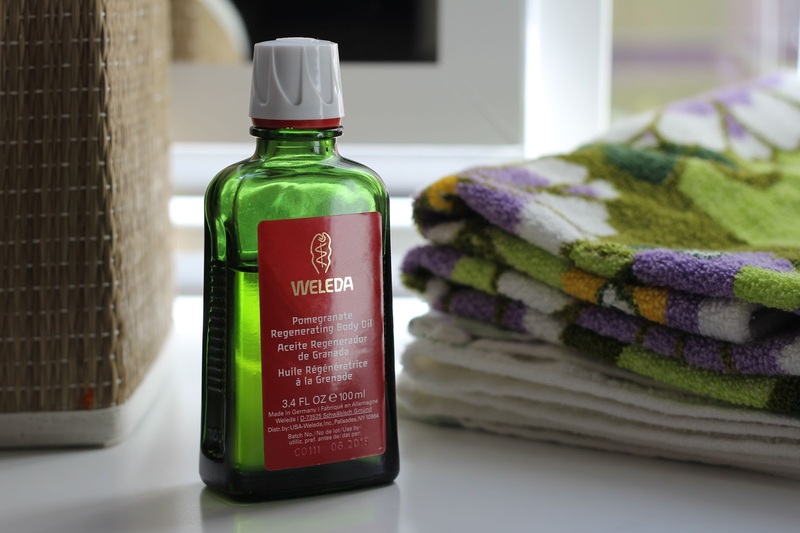 But it doesn't absorb as quickly as the Weleda Pomegranate Regenerating Oil so it could make a mess sometimes on the clothes or furniture that I've touched. This one is pure magic. You put it on, it does the job, sinks in and you're left with just great skin. I don't have much more to say about it, this oil is simply beautiful. I'm looking forward to trying more from Weleda's body care line. If all of it is just as good, then I've probably hit a gold mine.